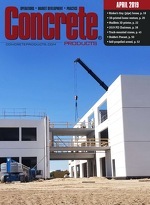 Concrete Products - Offering Guest Editorial for Concrete Producers. Systems and ideologies, such as the three sigma rule or lean six sigma, are used by companies to improve the quality and efficiency of their product manufacturing while minimizing defects and waste. Usage of the word “sigma” traces back to the mathematical concept of standard deviation (σ), and it is a way to define outliers or, in manufacturing categories, defects. The implementation of these “sigma methodologies” evokes a sense of quality and excellence, and therefore combining the word “sigma” and concrete is a creative way to represent high quality concrete. Furthermore, there are six specific attributes of concrete, all starting with the letter “S”, that directly contribute to high quality. Many of us in the California construction industry spent time this fall with one eye on the capital, Sacramento, hoping our legislators would at long last address the state’s crumbling highways, roads and bridges. Editorial boards, local agencies, citizen groups and construction industry and union leaders alike pressed for additional funding to improve our infrastructure. The American Concrete Institute’s just-released ACI 318-14, Building Code Requirements for Structural Concrete consolidates concrete mixture-specific references from 318-11 Chapters 3 (Materials), 4 (Durability) and 5 (Strength and Construction Issues) into new Chapters 19 (Concrete: Design and Durability Requirements) and 26 (Construction Documents and Inspection). The reorganization of these sections permitted an evaluation and elimination of some Code provisions related to concrete mixtures and construction when better addressed in other referenced standards. Industry projections reveal that by 2018, the demand for cement in Texas will exceed the supply for the first time. At about the same time, the Environmental Protection Agency is expected to reduce the ozone standard from 75 ppb to 65 or 70 ppb. As a result, all or portions of Central Texas are expected to be designated as a “non-attainment area” for ozone, making construction of additional capacity significantly more expensive. Here are a few thoughts for cement interests that want to expand their facilities or build new plants in this impending new regulatory environment. The contemporary use of structural concrete is a complex endeavor, requiring the skills, training, insights and experience of a broad range of professionals. These include designers, engineers, construction specifiers, insurers and code officials, as well as the general contractors, subcontractors and construction personnel.